This was an “above my expectation” workshop. I learnt a lot more than I had thought. And most of it is stuff I should have known earlier. Nonetheless now I am sure my thesis will be much better than it would have been without this workshop. It is an interactive and hands-on workshop which every PG student should go through before starting their thesis and also should be introduced at the UG level itself to help us learn and apply it earlier and in a better way. 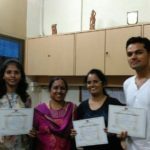 A big thanks to Vasu Ma’am for this wonderful workshop – Dr Pradnya Shinde.